Let’s return to our Boesinghe Tour. As the road winds its way ever nearer Boesinghe, this signpost points across the fields to Talana Farm Cemetery. 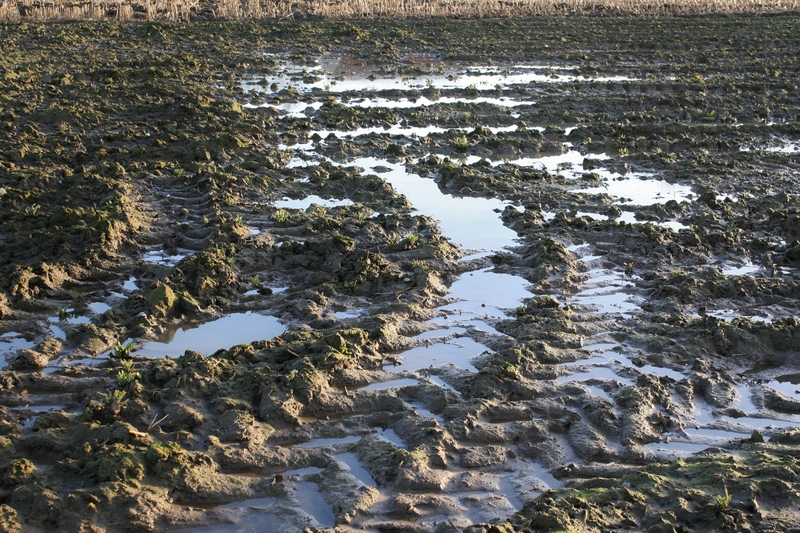 And luckily for visitors, there’s a pathway that will enable us to get there, because it’s a bit of a trek. Why Talana Farm? Well, the farm, and several others nearby, were so-named by the British after actions of the Boer War, including a battle that took place at Talana Hill in October 1899. 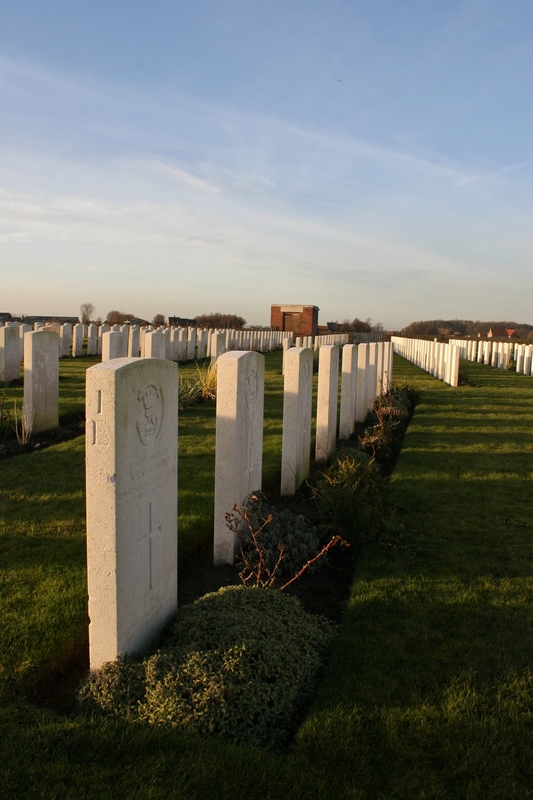 …before the first British burials were made by the Royal Warwickshire Regiment, who buried four of their men alongside the French graves on 8th & 9th June 1915, soon followed by six men of the Somerset Light Infantry a few days later. 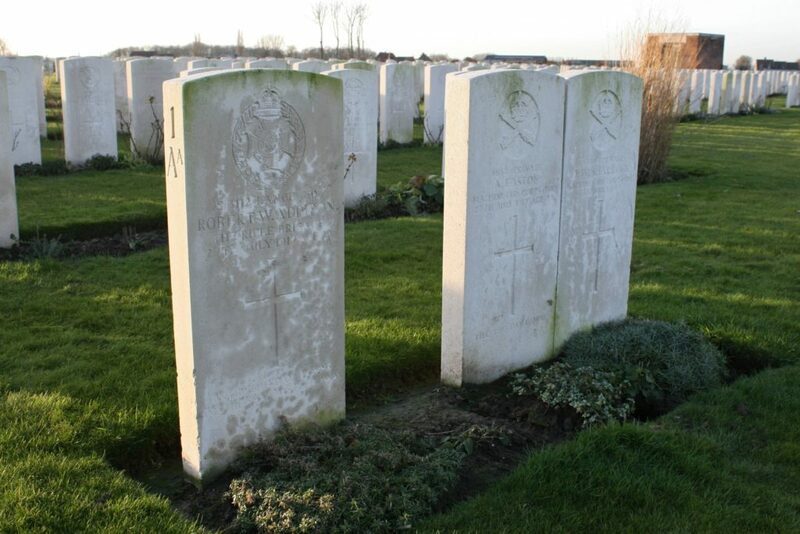 The first graves we encounter on entering, however, are these three men killed on 27th July 1917. 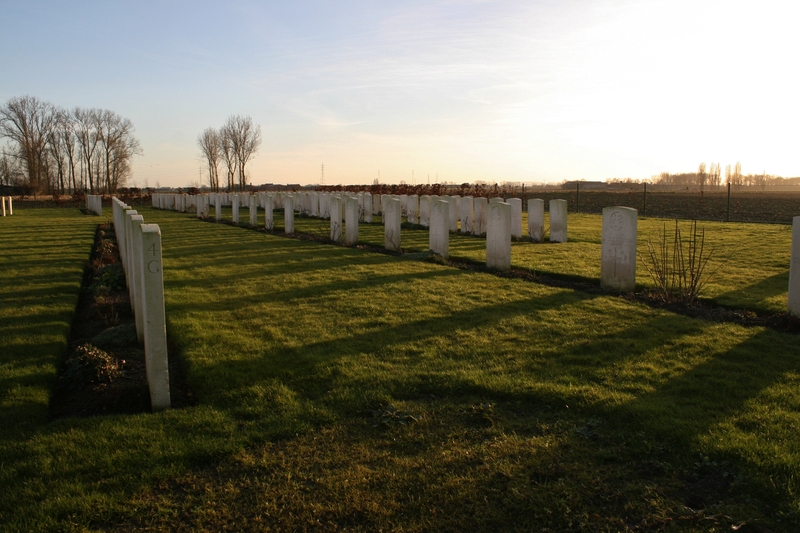 Here’s the cemetery plan for your perusal, courtesy of the CWGC. 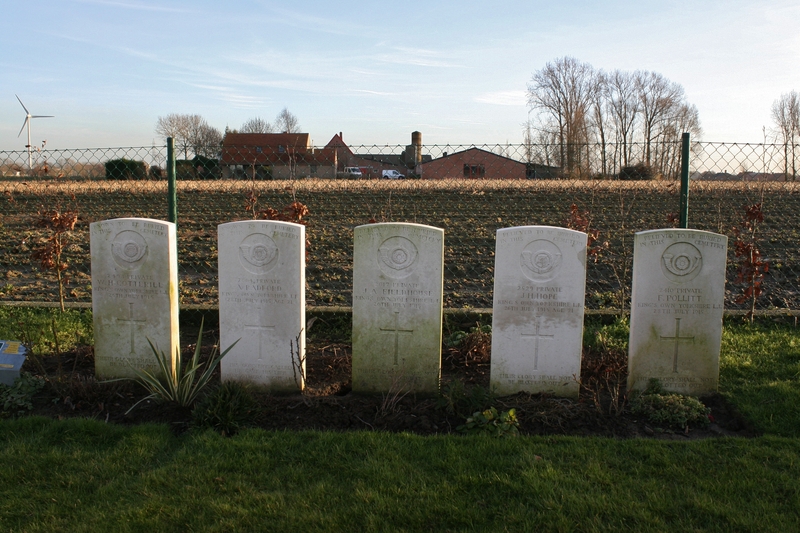 …behind which special memorials (one, on the far left, removed for renovation) remember six men of the King’s Own Yorkshire Light Infantry killed towards the end of July 1915, whose remains are known or believed to be buried somewhere in the cemetery, perhaps beneath the headstones of some of the sixteen unknown soldiers buried here. 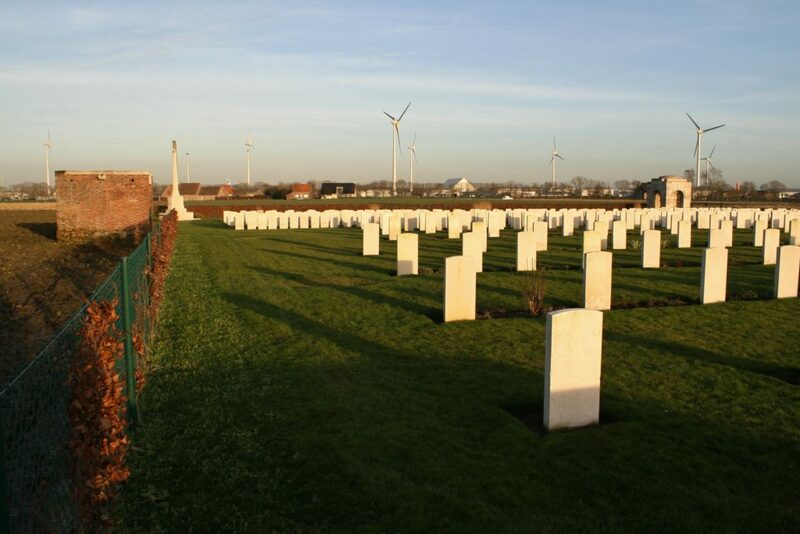 Beyond these headstones, you will notice the extremely low boundary wall that surrounds the cemetery, a green wire fence erected just in front of it. 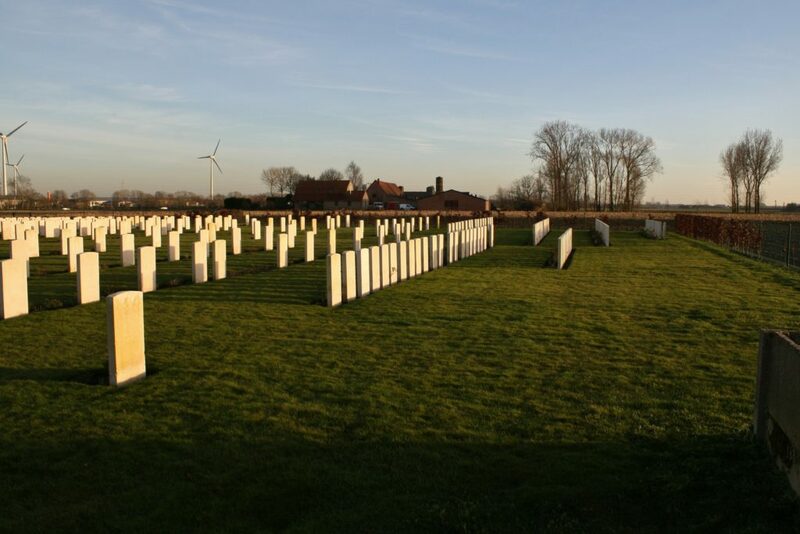 Ten more special memorials in Plot I Row E (above & below) to men of the Rifle Brigade & Somerset Light Infantry ‘Buried Near This Spot’. 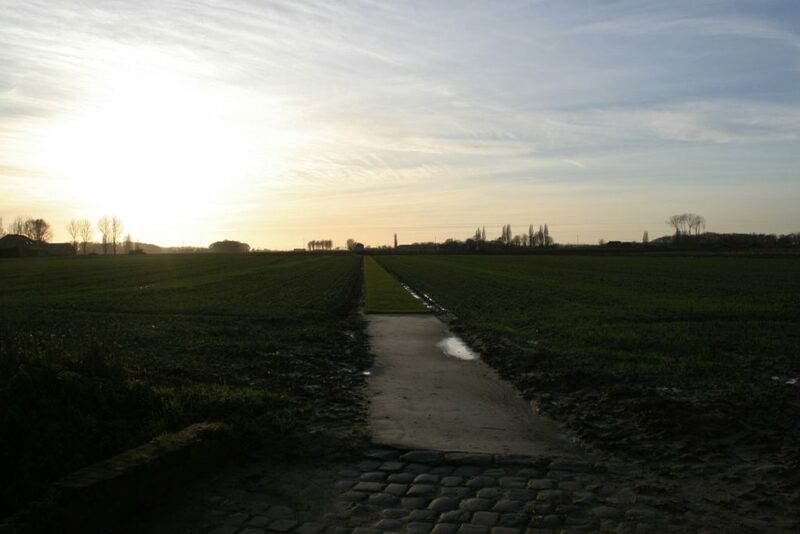 The men whose bodies lie ‘near this spot’ all bear the date of death of 6th July 1915. 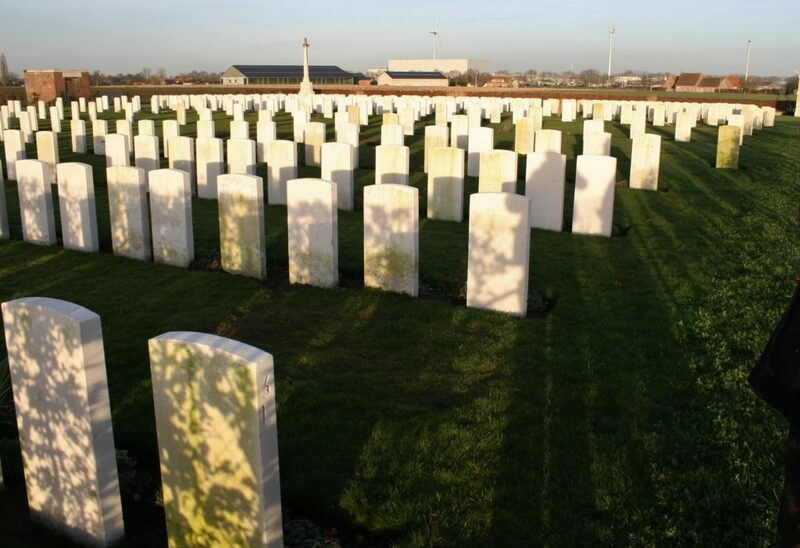 Indeed no fewer than 84 of the 515 identified burials in the cemetery died on that date, and a further seventeen over the next three days, on which more later. 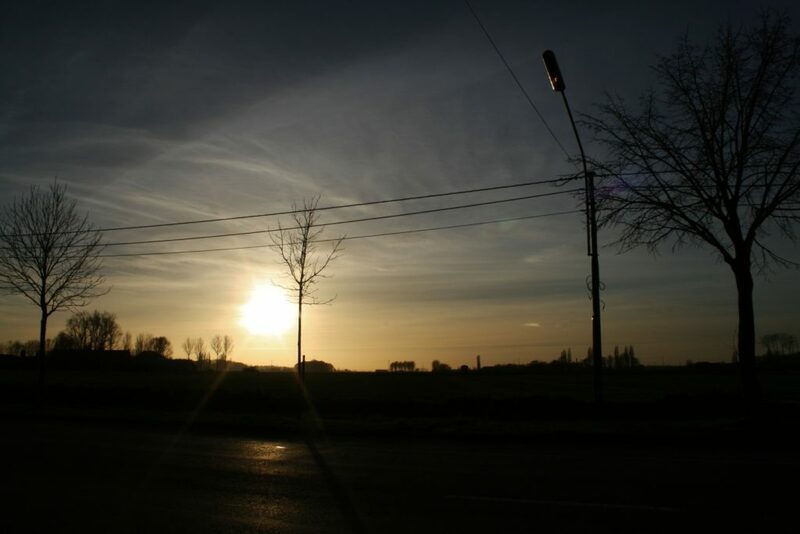 …Plot III nearest the camera. 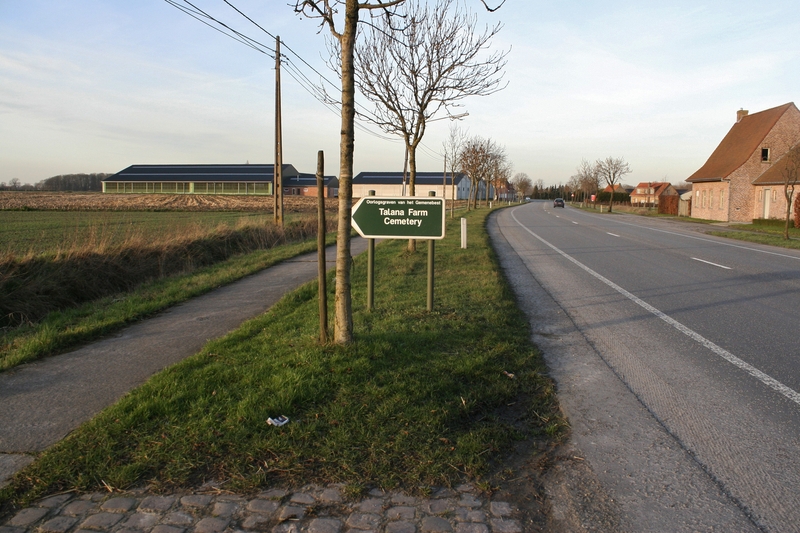 Many of those buried in this plot, and the adjacent Plot IV, are men of the 49th (West Riding) Division, whose memorial overlooks Essex Farm Cemetery, and who used all three cemeteries along this stretch of the canal during their time in the line in 1915. Twenty three of these are men of the Duke of Wellington’s (West Riding Regiment) killed on 19th December 1915, the day of the first German phosgene attack. Which means we have accounted for, for want of a better expression, seventy seven of the 120 dead the division suffered that day, in the three cemeteries we have visited so far on this tour. 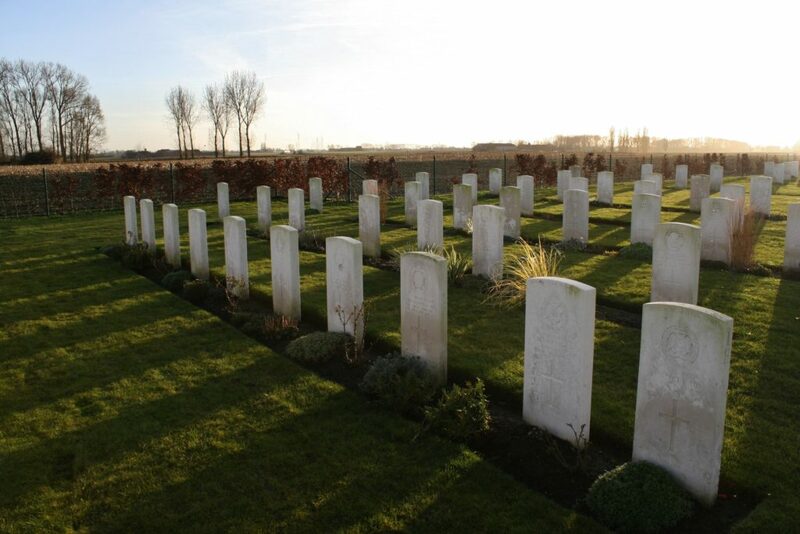 One or two men who were probably gas casualties that day can be found in other cemeteries further to the rear, but that still leaves between thirty and forty men who died on 19th December who have no known grave, and again I wonder whether some of their graves were once in these cemeteries along the Ypres-Boesinghe road, and were later lost to German shelling. 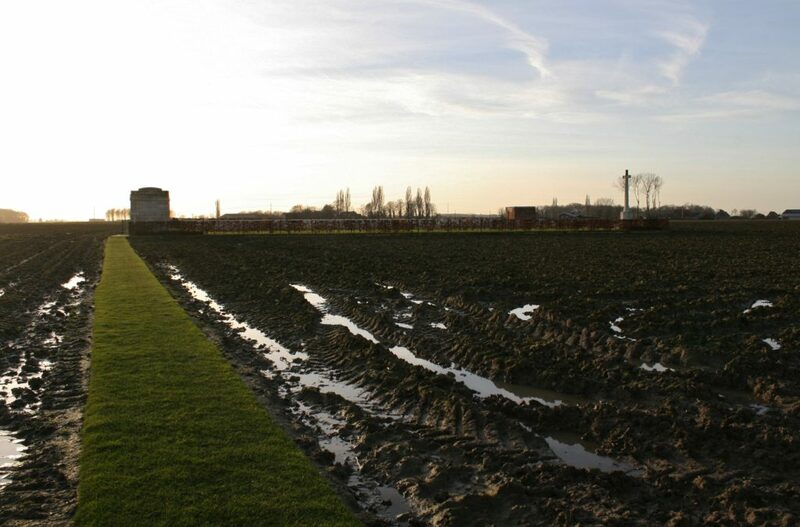 …suggesting that there probably were many more graves here once. 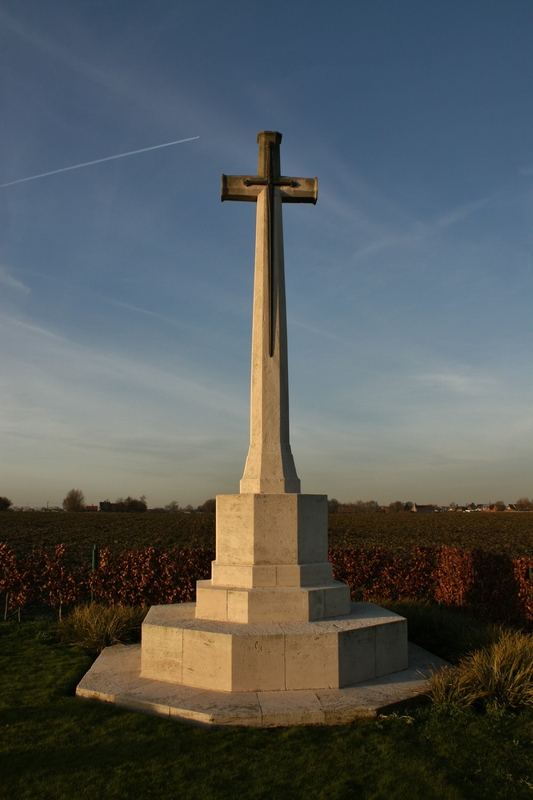 The CWGC website also suggests that this might well be the case here at Talana Farm, and as you know if you have read the previous few Boesinghe posts, I think the same applies to both Essex Farm & Bard Cottage Cemetery, German artillery from over the canal accounting for some of the graves in all three cemeteries over the course of the war. Talana Farm Cemetery continued in regular use until the end of 1917, although half a dozen men were buried in Plot IV Row J (third row from right, in the background) in the early months of 1918. View from the north western corner of the cemetery looking east, Plot IV still nearest the camera. 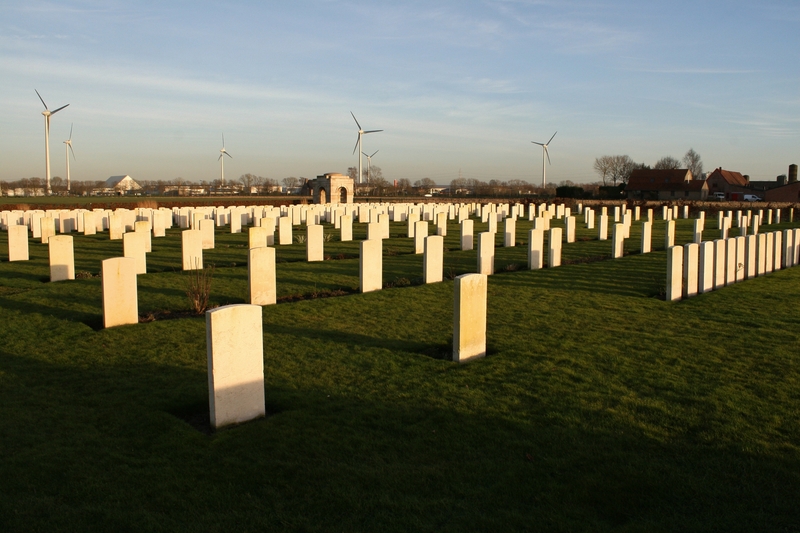 The houses beyond the Cross of Sacrifice line the road, but most of the other buildings, and the wind farm, are located on the eastern side of the canal. More graves in Plot IV (Row G on the left, Row H on the right) as we make our way towards the Cross of Sacrifice (below). 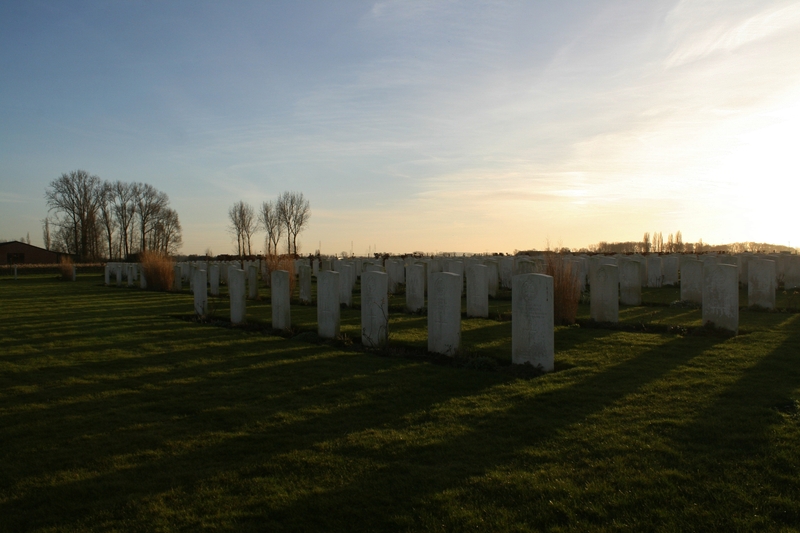 If you enlarge the picture you might notice a large number of Royal Artillery graves in the row behind Row H, and indeed many of the later casualties in 1917 are men of the Royal Garrison Artillery, whose heavy guns would have been brought up to here as the tide of war moved east towards Passchendaele, guns that would have been targeted by their German counterparts. 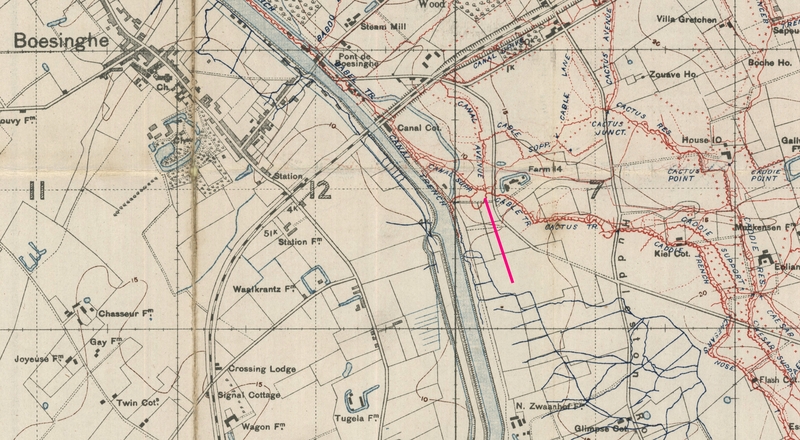 …as a consequence of a ‘small but successful’ attack the British made on International Trench, part of the German front line about a mile north east of Talana Farm, and which I have marked in pink on the above trench map. 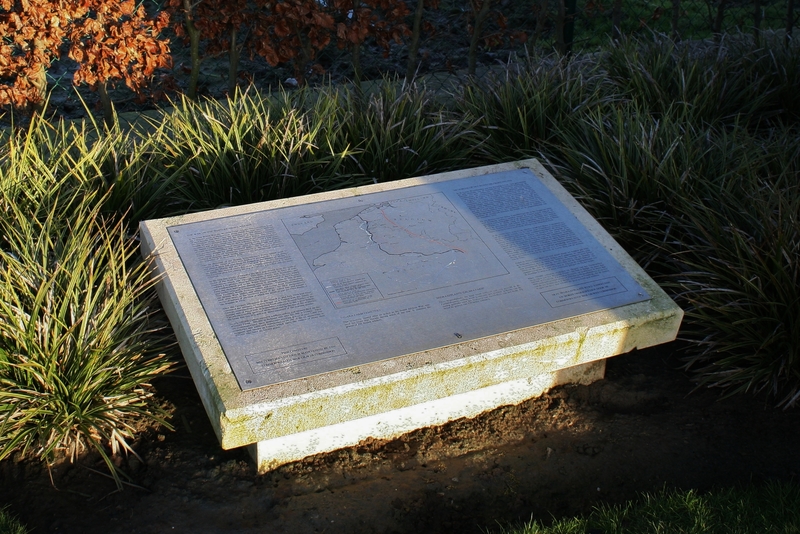 Following the action, which we shall return to in more detail much later in this tour, International Trench no longer existed in any usable sense, and certainly was long gone by the time of this 1917 trench map, hence its ommission. Talana Farm, marked at the bottom of the map, was originally a moated farm in the fields a few hundred yards to the west of the Yser Canal. 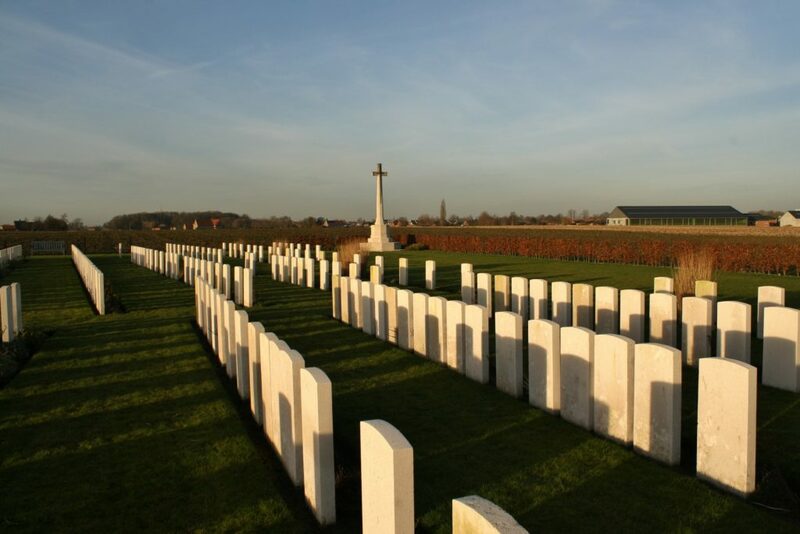 Considering the British official casualty figures for the International Trench operation quote a figure of 366 dead between 6th & 11th July, and as already mentioned 101 identified men killed over those dates are buried in this cemetery, and as there are no other cemeteries in the area with more than a handful, if that, of men killed on these dates as far as I can see, there are a huge number of men killed over those six days whose bodies were never found and whose remains must still lie beneath the industrial estate on the other side of the canal, and we shall return to this fact later in our tour as well. 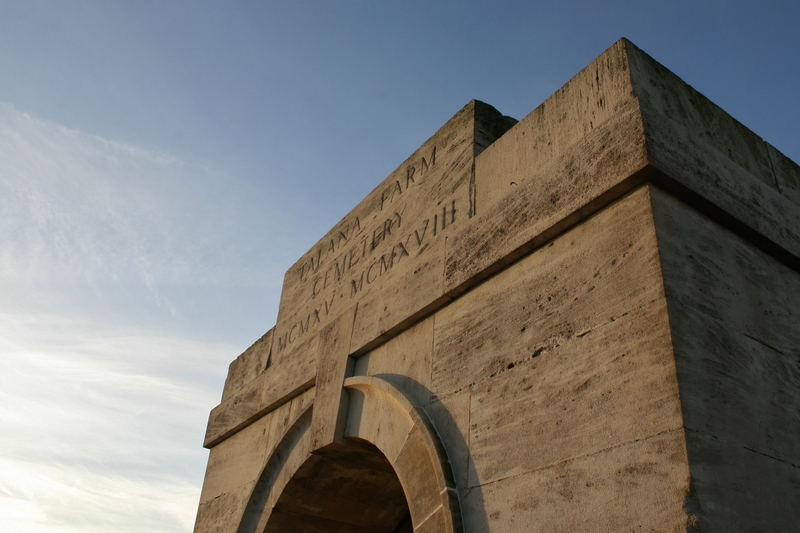 Back at the entrance; I suspect the space between us and the Cross of Sacrifice once contained the French burials mentioned at the beginning. 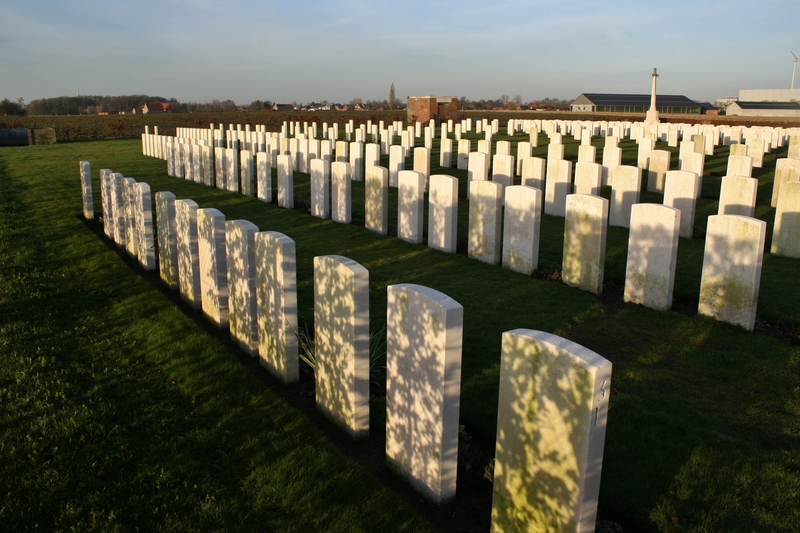 Incidentally, every single grave in the cemetery today is a casualty from the United Kingdom. Next, we will arrive in the outskirts of Boesinghe, where, despite the utter destruction of the village during the war, there are still a number of sights to see, and stories to tell, as we continue our trip north. Click here for Part Six.